Jared Unzipped: Interesting Facts About Watermelon. A square watermelon? Don't worry, I explain below. I (not so) graciously consumed a slice of watermelon earlier. It was quite delicious and definitely satisfying. Accordingly, I figured hey... why not drop some watermelon facts on my audience? Nothing hot and heavy here for you to process this evening, just some cool facts about a cool fruit... and a vegetable? Yes, watermelons are both a fruit and a vegetable. They grow from a seed, making them a fruit. And yet, they are within the same family of vegetables as pumpkins, squash and cucumbers. The watermelon is a trans-food substance! How progressive! The wild watermelon, which looks much different than the watermelon we typical eat, originated in southern Africa. A watermelon is 92% water, making it a natural thirst quencher and great for your kidneys. Watermelons also contain high amounts of manganese, Vitamin C, Vitamins B1 and B6, Vitamin A and potassium. Watermelons are also packed with electrolytes, making them a much better choice for consumption over sugar-filled energy and athletic drinks. Most of the world's watermelons are grown in China. In China, the rind of the watermelon is eaten like a stir-fried vegetable. Japan has the strangest watermelons of all. 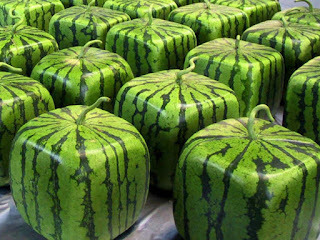 You can purchase higher-end square watermelons, which are seen as fashionable. How do the farmers do it? They grow the watermelons in square glass containers, in which the melons gradually take on the shape. We really need these in the USA! The heaviest watermelon ever recorded was nearly 270 pounds. You can carve a watermelon just like a pumpkin at Halloween. When you light it with a candle, the red interior takes on the spooky appearance of blood! I did this as a child many times and can verify that it works. And now, for you viewing pleasure (and just because it's my blog and I can do what I want), here is a video of an exploding watermelon!